Startup is one of the most exciting phases of business. It’s also the most energy-intensive and challenging. And it’s also the stage that causes many businesses to fail. Today I want to tell what you need to know to successfully navigate your business beyond Startup mode. Because it’s a nice place to pass through, but you definitely don’t want your business to live there. Think of Startup like a plane getting liftoff. In order to defy gravity, the plane needs to accelerate down the runway to a high speed, using a ton of fuel and force to gain liftoff. If there isn’t enough fuel, momentum, and runway the plane is not going to take off. How disappointing for all those people looking forward to a weekend in Vegas. If your business doesn’t have the right kind of fuel, momentum and runway (i.e., TIME), you’ll be stuck on the runway too. When you get your business beyond the startup or bootstrapping phase, you won’t have to spend quite so much energy on liftoff (marketing!) and can focus on other things, like better ways to serve customers, how to leverage your brand and marketing platform, and improving your conversion rate (i.e., enrolling more clients with less energy). But if you’re stuck in startup mode, trust me. You won’t have the time or energy to do any of those things and chances are high your business will continue to feel like you’re swimming upstream. So, are you stuck in Startup? You’re practice isn’t full. 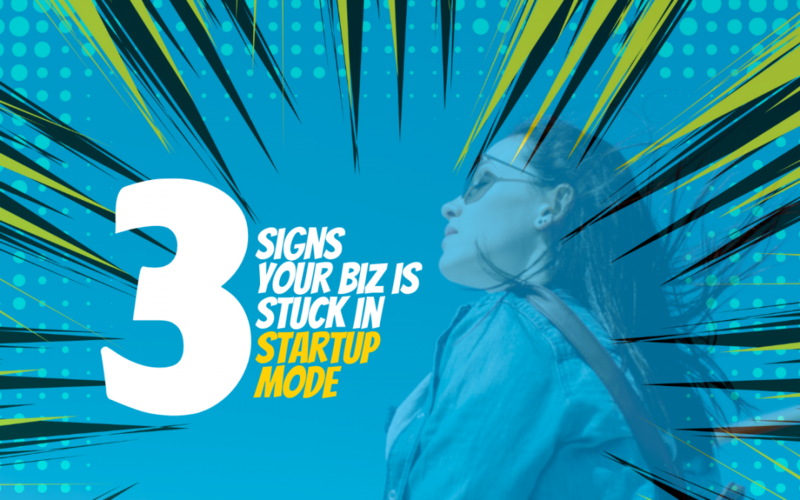 If you have no clients, just a handful of clients, or not even close to the number of clients (and income) you want in your business, chances are you’re stuck in startup mode. Your marketing message is in constant flux. If you talk about your business differently every time someone asks you about it, if your marketing message isn’t clear, and if you’re struggling to create core content (think website home page), then chances are you’re still in startup mode. You don’t have a reliable, repeatable marketing system. If you are constantly throwing spaghetti at the wall to see what works to attract and enroll clients, even if you’ve been in business for a while, you may be idling in startup mode. It’s important to remember that Startup is not defined by how long you’ve been in business, it’s defined by the stage of your business based on the specific benchmarks. I once worked for a finance startup in Boston that had already been in business for about 7 years and had received a 7 figure round of venture capital funding. But, because of the stage of business it was in, it was still considered a startup. If you don’t have rock solid footing in all five of these areas of your business, then you are still in the startup phase. On the plus side, this is a great checklist to help you assess where your business is at and tell you what remaining benchmarks you need to complete before your business can grow to the next stage. In order to truly experience profitability, growth, stability and more sustainable operations in your business, you will need to first master the 5 benchmarks that will get you through the startup stage. If this sounds like a challenge, it is. Statistically, most businesses fail because they never make it beyond the startup stage. My specialty is helping coaches like you get beyond the bootstrapping stage of your business. How do you do that? By building a strong foundation for long term growth, using a step by step process that helps you move through the benchmarks of startup, getting your business off the runway and into the air.